Lucky, lucky, lucky! Follow two adorable friends at play in a read-aloud for the very young that trips off the tongue. Ready, set, go! Whether you’re playing pretend games (beep, beep) or flying off the slide (ka-thump), flopping into a puddle (splish, splash) or running around a tree ("Can’t catch me! "), an afternoon at the park is so much better when your best buddy is there. Peep and Ducky share giggles and tickles and bumps in this sweet excursion from David Martin and David Walker. 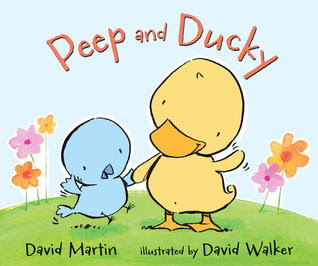 David Martin's Peep and Ducky is quick and adorable. It boasts easy, flowing rhymes that will have kids eager to read, and hear, over and over again. It's the rhyme scheme that I think will really appeal to children, especially those who are just learning to read. When read aloud, Peep and Ducky's adventure sounds so upbeat and exciting; it's bound to make the little ones smile! David Walker's illustrations work in harmony with Martin's story. The colorful pictures are simple enough for a child to grasp the concept of events, particularly important if the audience cannot read yet, and detailed enough for the older ones to appreciate. Ages at least 1-3 will enjoy the story, but I think it's one that will stick in a child's mind for a while longer. Whether Peep and Ducky are playing make believe, racing around and playing in the mud, Martin and Walker expertly portray fun and friendship; the promise of another perfect day.